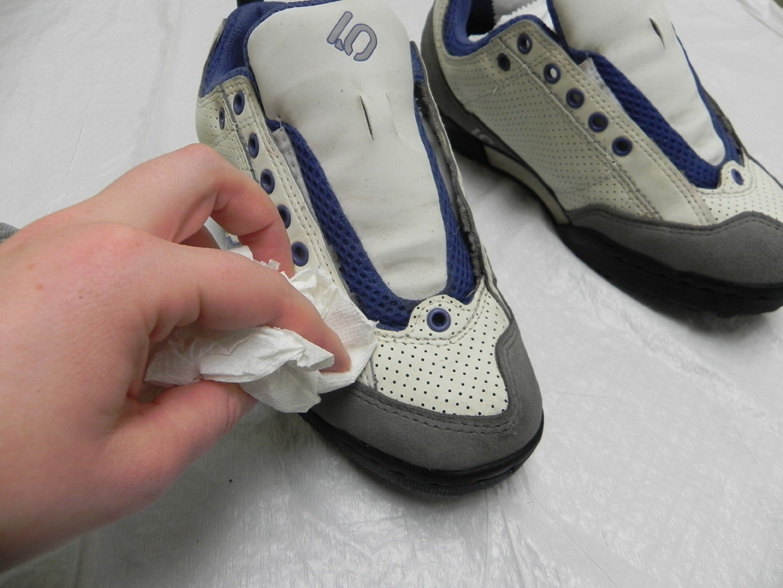 Keeping your shoes clean, it’s easier than you might think! 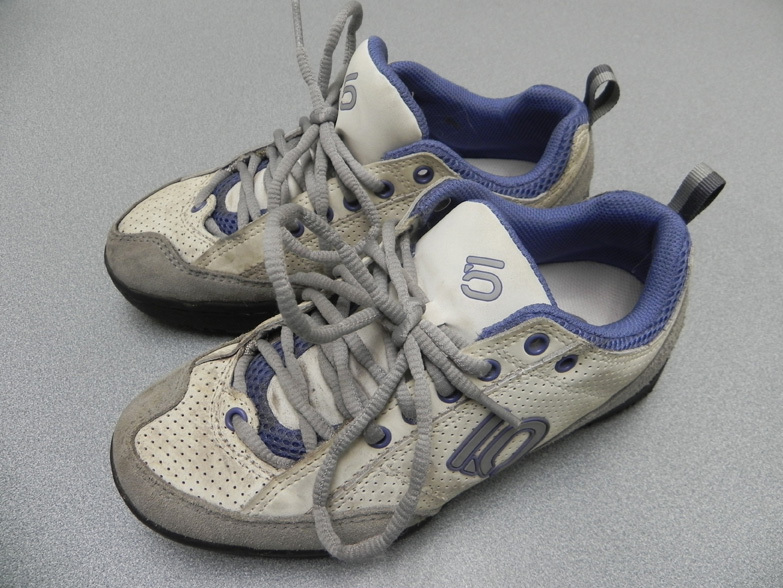 Now, I’m not one to normally clean my shoes with regularity, however, not too long ago I acquired a pair of super cool 5.10 approach/ parkour shoes. I’m no parkour aficionado, but I do get out to climb a bit, so I was psyched for some new kicks. The downside was that these shoes were white, meaning they would stay white for about 5 minutes after I took them out of the box. 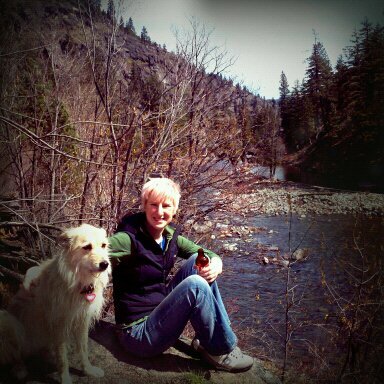 Sure enough, after an outing or two, they were downright filthy. In order to bring my shoes back to a state that would at least be appropriate for frequenting a dive bar, I turned to my Nikwax arsenal to get them clean. 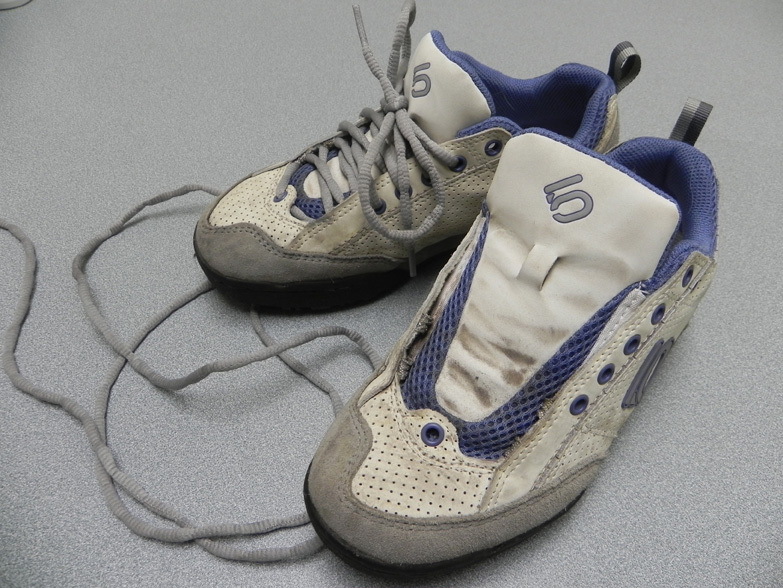 In order to prepare for the overhaul, I removed the laces and insoles in order to get better access to all parts of the shoe. Good thing too, as you can see the tongue was particularly filthy. Remove the laces and insoles. The next step was to get the shoes good and wet- like wetting your hands before soaping them up. Get those shoes good and wet! Then, I grabbed Nikwax Footwear Cleaning Gel and went to town. 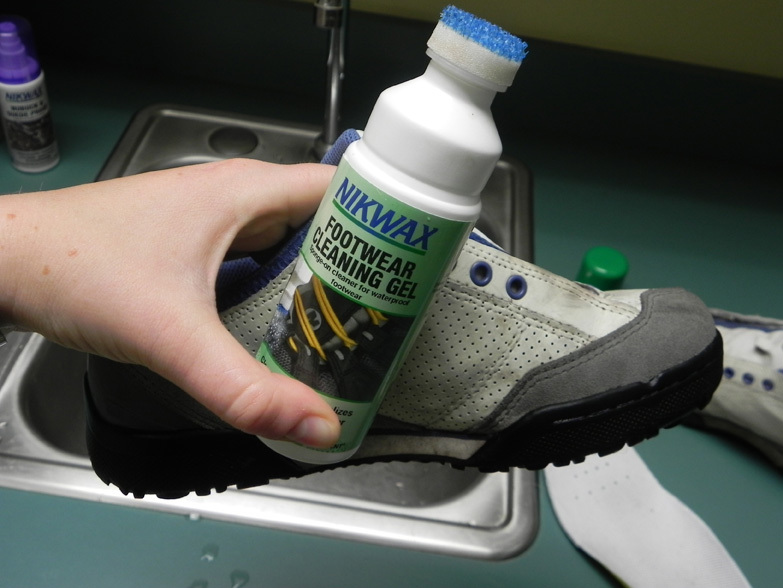 Nikwax Footwear Cleaning Gel to the rescue! I scrubbed like a mad person. Then, I rinsed off the Cleaning Gel suds. I was amazed at how much cleaner they were! Now, these shoes will never be waterproof. As you can see, they have holes all over them and there is no Gore-Tex membrane either. However, in order to help prevent further dirt and mud from corrupting my shoes, I thought, “it couldn’t hurt”! So I grabbed a bottle of Nikwax Nubuck & Suede Proof Spray-On (as the shoes are of the textured leather persuasion). I sprayed the shoes thoroughly and evenly. I used the spray-on version. 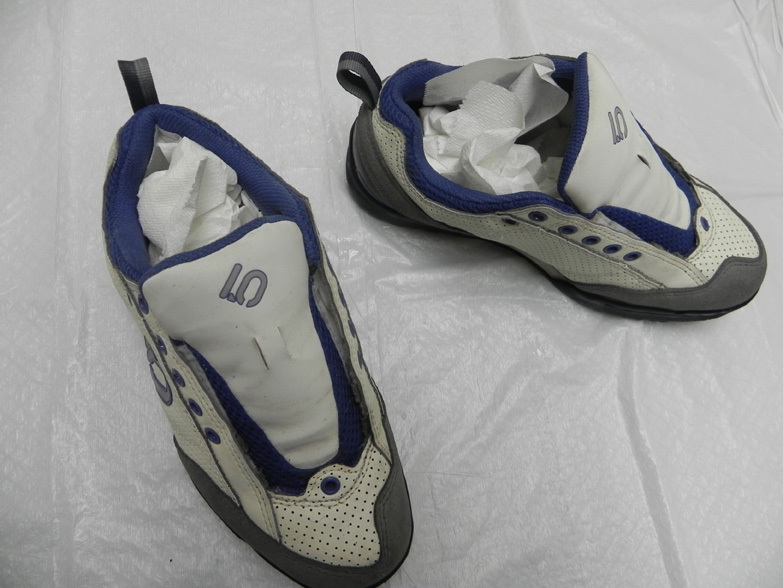 Then, I set the shoes on a protected surface so they could dry. I also put some paper towel (newspaper works too) inside them in order to help them dry faster and soak up any water that got inside. You never want to accelerate the drying of your shoes with heat, as it can damage the uppers, as well as compromise any glued parts. After a couple minutes I checked on them and removed any excess (pooling, etc.). I let them dry over night. 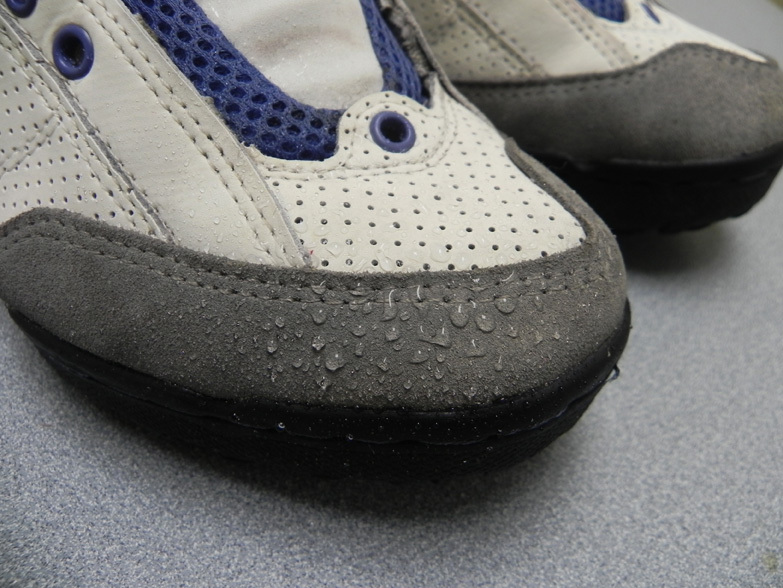 the next day gave them a little spritz to check the water repellency- They look great! Look at that beading action! Now to go get them filthy again! Categories: Gear Care | Tags: 5.10, approach shoes, clean, cleaning, climbing, dirt, dirty, five ten, Footwear, Gore-Tex, How-to, mud, Nikwax, nubuck, parkour shoes, rock climbing, Shoe, sneakers, suede, Waterproof, Waterproofing, white shoes | Permalink. Helge Pederson’s advice on how to stay dry on motorcycle rides. How often should I clean my jacket? 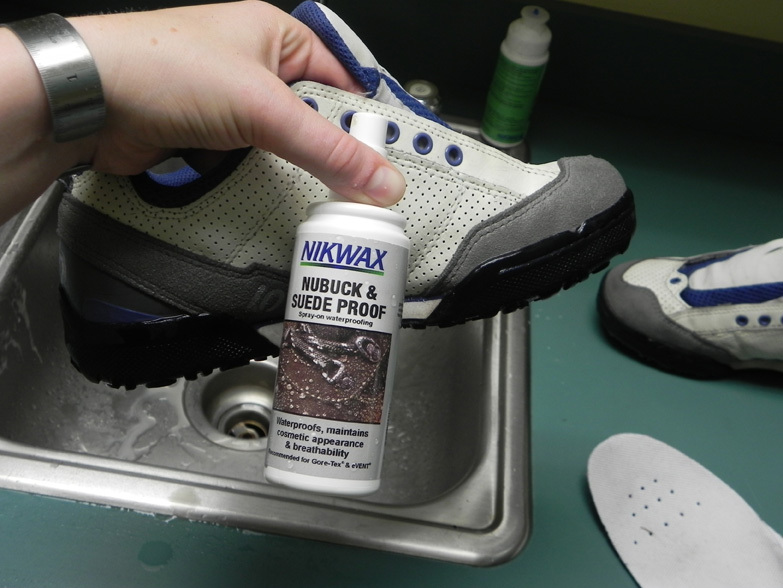 Dear Professor Nikwax: How do I care for my footwear?